One of the things I love about being a reviewer is that I get to read so many books, in genres that I might otherwise overlook. Missing Pieces: A Woman’s Search for her Birth Family is one of those books. Don’t let the genre/topic of this book fool you. This is not your typical memoir. Missing Pieces follows the journey of young Cheryl as she is torn from her family and the tumultuous effects this has on her life. With an alcoholic father and overwhelmed mother, Cheryl still managed to feel love from her older siblings. But the State felt otherwise and took charge of the situation. Soon, all the children were removed from the home and placed in foster care. Originally placed with a caring couple in a big farmhouse, Cheryl watched as one after the other of her siblings was adopted. Eventually, she too was adopted. Life at first seemed bright for the curious girl with her adoptive parents. But slowly the child’s mother began to change and violence erupted. With a father who was absent for long periods of time due to his work, Cheryl was at the mercy of her adoptive mother. The first signs of trouble are when the mother starts to verbally abuse her young charge. Having never been truly loving toward her new daughter, the adoptive mother’s angry words soon morphed into physical abuse. This is the beginning of years of incredible hardship for Cheryl who is unable to confide to anyone the torture she is enduring. On the rare occasions when she runs away and tries to talk to her grandparents, she still gets returned to her abusive mother. Cochran tells the story of young Cheryl in the third person, describing the feelings, both emotional and physical, that the child is suffering. The words come from a distant, but caring, narrator. It is clear from the start that Cochran is talking about her own painful childhood and it is done in a sensitive and compassionate way. Some of the episodes of Cheryl’s abuse are hard to read, but I found myself unable to turn away. “Where is her father?” “Why doesn’t somebody take the child away?” I asked these and other questions as I sped through the book. A unique and interesting twist to the storytelling is that this book is divided into two separate yet equal parts. 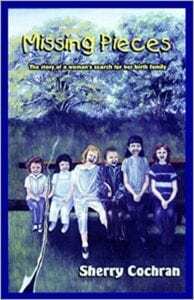 A few chapters describing Cheryl’s turmoil, and then, just when you are deep into the story and need to turn that page to see what happens, the next chapter transitions to Cochran’s search for her birth family. It is a successful technique that keeps the reader turning the page; equally interested in both the search for Cochran’s family and in following the child’s life. Quill says: This heartfelt tale is one that should not be overlooked.